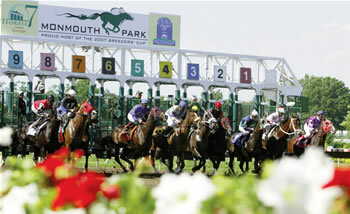 The 2011 Monmouth Park 7-day race meeting through Memorial Day is a far cry from the ballyhooed "Elite Meet" of 2010 marked by inflated purses but equally frothy gains in "handle" (parlance for dollars bet), with an underwhelming average of eight horses for the 11-race card on Saturday's opener -- no surprise considering the shamefully iffy ownership of The Shore's Greatest Stretch. Optimistic: New ownership will be in place by June 1 and shake sensibility into New Jersey's horsemen and breeders that the 2011 meet should follow the "2011 Season Events" spelled out in a marketing brochure that hit my mailbox this week and, even if ambiguous out of necessity, hints at a rational schedule from May 14 through Labor Day, with live weekend racing until the scheduled Oktoberfest celebration on September 25. Kudos to Monmouth's marketers for working with what is likely a sliding scale and recognizing the customer with free admission and race program passes (via the circular), and lending some sanity to what the bettor is seeking - i.e., fuller race cards, more opportunity to win low-takeout exotic wagers (more later on this). Maybe Mr. Bailey's ownership of the Resorts casino (and eventually Monmouth Park) will give racing an breath of hope in persuading the Governor (though I put the odds at a million-to-one) that slots at the Meadowlands is a plus, rather than a detriment, to NJ. Even-less likely: Ownership will change and racing will proceed by the laborious calendar on Monmouth's website and in accordance with the legislature's preposterous law for 141 thoroughbred racing days annually through 2016, as endorsed by the Horsemen and Breeders "associations"...but to anyone who watches the sport knows is overdone. I'm no expert at reading the horsemen's conditions book, but Saturday's card reflects a head-scratching hodgepodge of low-budget $5k-$30k open (i.e. horses bred in any state) claimers, a $75k stakes that with just seven horses and, check this out, two $50k Jersey-bred starter allowances and two $80k-$100k J-bred maiden claiming races! I agree that every effort should be made to promote the state's breeding, but graded-stakes-placed Nacho Friend (second to Trappe Shot in the 2010 Long Branch and a game third in the 2010 Gotham Stakes prep to the Kentucky Derby) is running in a $32k optional claimer. This indicates to me that few connections with big-name horses would commit to stabling and entering horses this early at Monmouth - a big negative for horseplayers and a detriment to those marketing the event. Then again, I guess this is what the fans and horse owners alike get because of the sketchy ownership status for Monmouth Park. In short, the state's thoroughbred industry leaders need to get their act together quickly, as Gov. Christie has accurately suggested (though eliminating subsidies as the vehicle to brokering a quick sale of Monmouth Park is extremely short-sighted). A reorganization of the purse structure is a must, and the industry needs to make much greater strides in marketing its product to a vibrant, younger audience. However, Saturday's opener reflects reductions of two races (including one less stakes event) and 40% in the number of entrants for the 2011's opener versus 2010's - both bearish indicators. From the perspective of the horseplayer, the managers at Monmouth Park deserve a ton of credit for attractively-low 15% "takeouts" (i.e. what the track keeps) on Pick 4, 5 and 6 wagers and offering a new 50-cent Place Pick Six that is sure to win bettors' dollars away from other U.S. tracks and is breathing life amid the track's shaky status, but otherwise the rest of the interests need to come together and do a better job of listening to what the customers offer in terms of rational solutions for saving The Shore's Greatest Stretch beyond Memorial Day. It's great to see that new 50 cent Place 6 wager. I'll be mulling that over especially on carryover days. But there is a dire need to cut the win-place-show pools to 10% and stimulate wagering in these underperforming wagering pools. I do not think it is in Monmouth's (or any other track) to hawk the more difficult wagers to newcomers whose bankrolls (and minds) cannot afford it. Attracting fans to the track is but half the step. Making them want to come back again and continue to wager is the other half. That $80K-$100K mdn claimer caught my eye too -- claiming prices may as well be $800K-$1M. I'd set the over-under on # of NJbred Maidens being claimed for $80K this summer at Monmouth at 0.5 (and I would take the under).